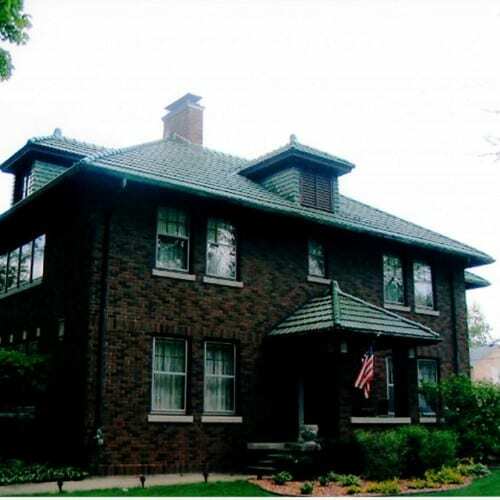 The Morris Downtown Development’s Historic Preservation Committee oversees Morris’ Heritage Homes project. 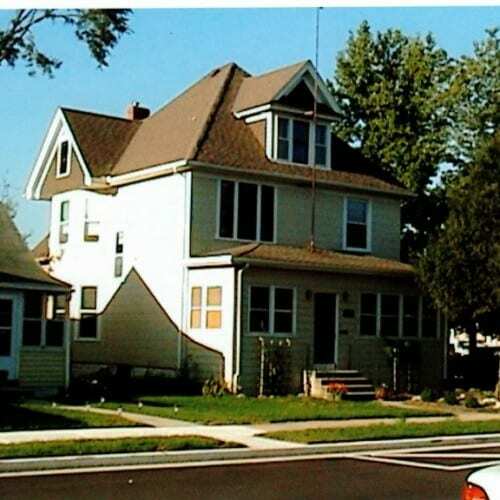 The project serves to identify the historic homes within the City of Morris, to encourage their preservation, and to promote an awareness and appreciation of the community’s history. 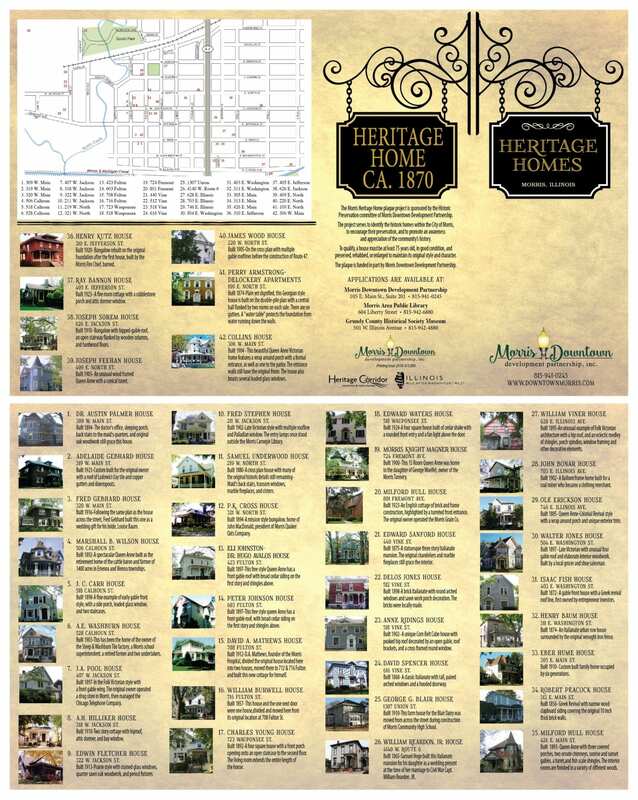 Click for a printable Heritage Homes brochure! 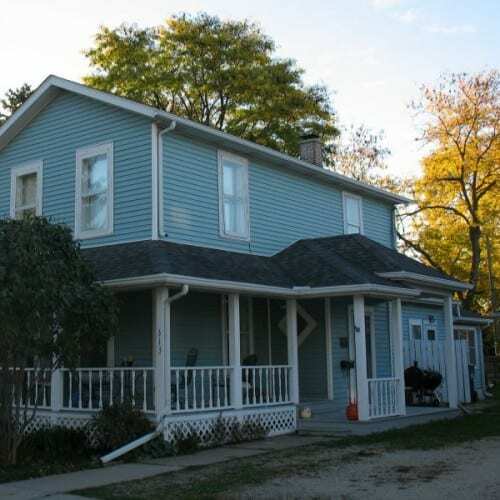 The doctor’s office, sleeping porch, back stairs to the maid’s quarters, and original oak woodwork still grace this house. 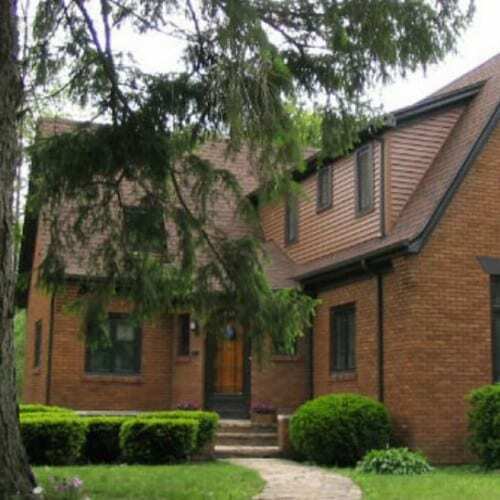 Custom built for the original owner with a roof of Ludowici clay tile and copper gutters and downspouts. 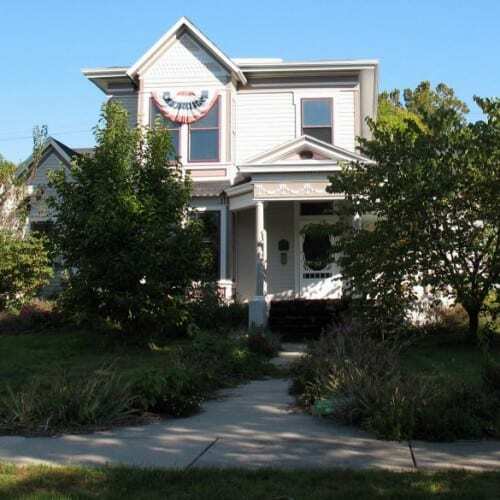 Following the same plan as the house across the street, Fred Gebhard built this one as a wedding gift for his bride, Louise Baum. A spectacular Queen Anne built as the retirement home of a cattle baron and farmer of 1400 acres in Erienna and Vienna Townships. 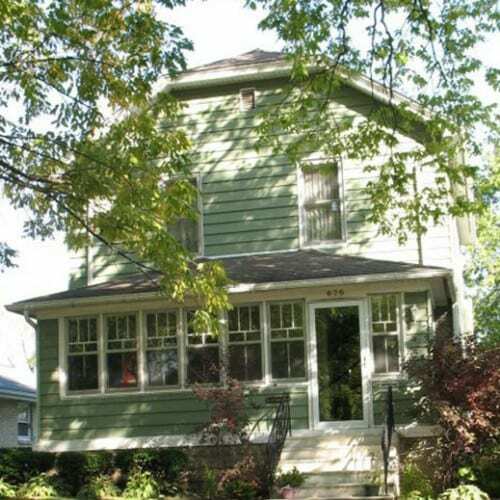 A fine example of early gable front style, with a side porch, leaded glass window, and two staircases. 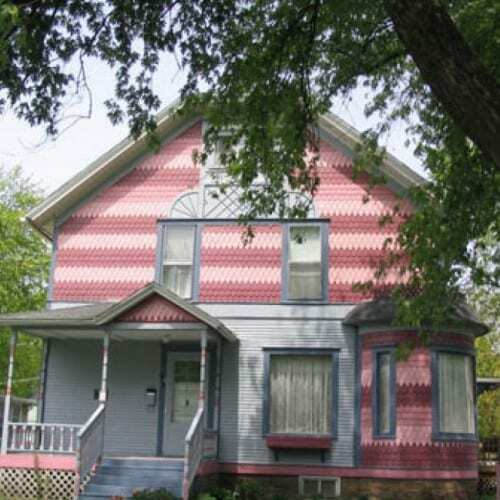 This has been the home of the owner of the Steep & Washburn Tile factory, a Morris school superintendent, a retired farmer, and two undertakers. 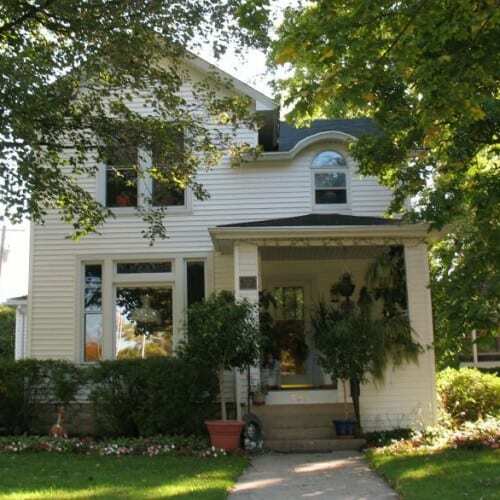 Built in the Folk Victorian style with a front gable wing. 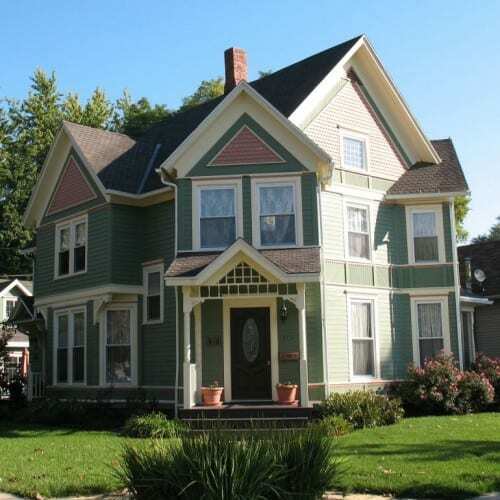 Today, the home still includes many details of the era it was built in. 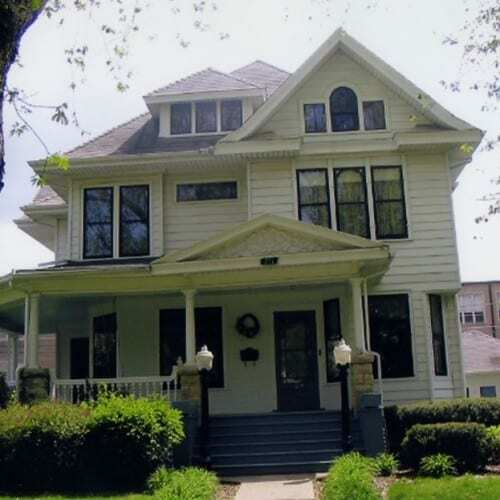 The house, situated in an area with many other historic homes, features an oak staircase, French doors, stained glass, and detailed crown moldings. 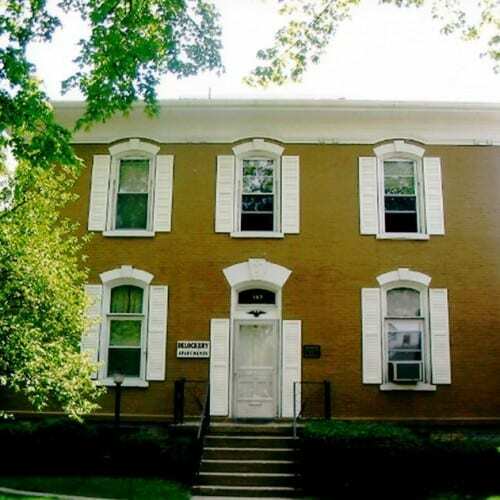 It was originally home to the owner of a Morris drug store and manager of the Chicago Telephone Company, which was the largest suburban telephone exchange in the country at the time. 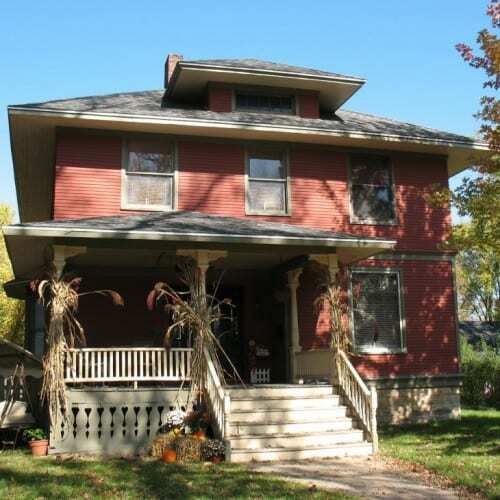 Prairie style with stained glass windows, quarter sawn oak woodwork, and period fixtures. Late Victorian style with multiple roofline, including a Palladian window. The entry lamps once stood outside the Morris Carnegie Library. 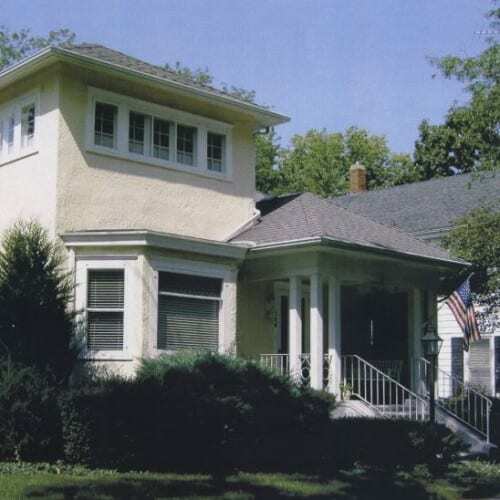 A cross plan house with many of the original historic details still remaining— maid’s back stairs, transom windows, marble fireplaces, and cistern. 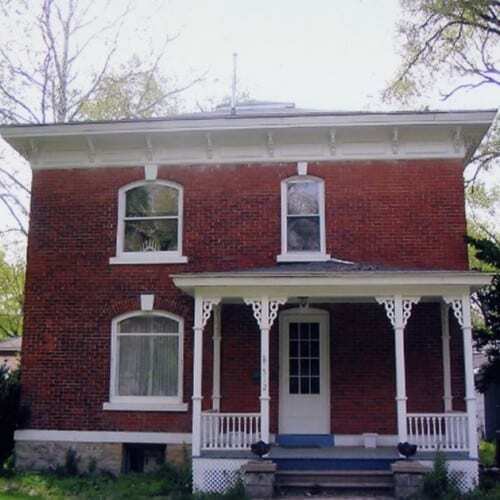 A classic example of Italianate architecture with a low pitched roof, tall chimney, and arched porch. 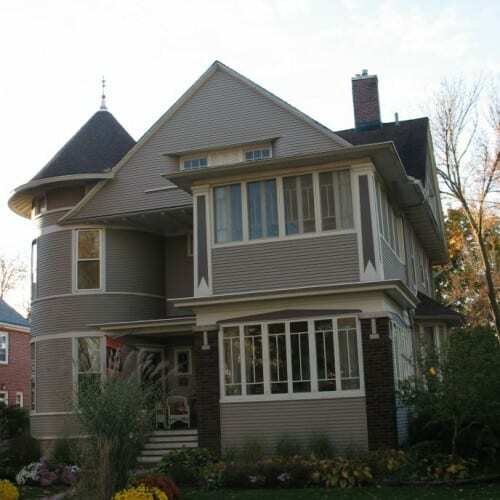 This free style Queen Anne has a front gable roof, with broad cedar siding on the first story and shingles above. 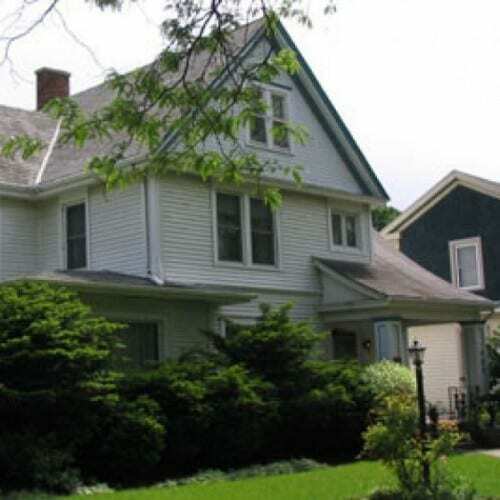 David A. Mathews house is a charming cottage built by a prominent local businessman and farmer. 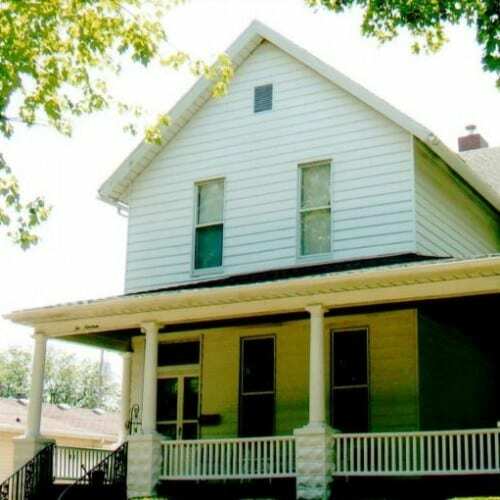 He had the original home located on the property divided into two houses; then he moved down the street to 712 and 716 Fulton. 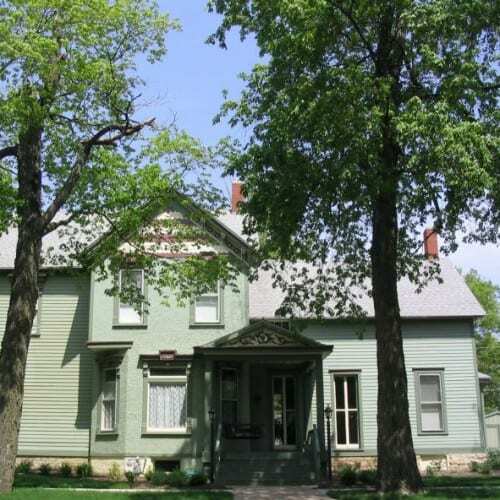 The 716 house, now called William Burwell House, is also a Morris Heritage Home. Mathews also founded Morris Hospital in 1906, which still serves the community to this day. 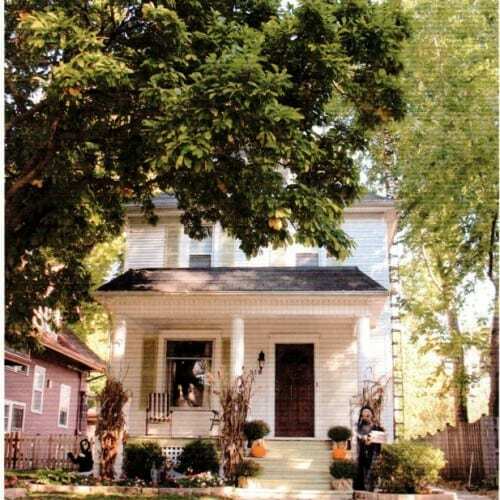 This house and the one next door were one house, divided and moved here from its original location at 708 Fulton Street. 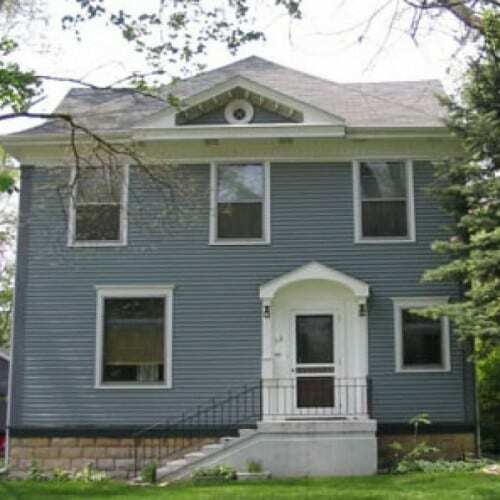 A four square house with a front porch opening onto an open staircase to the second floor. The living room extends the entire length of the house. 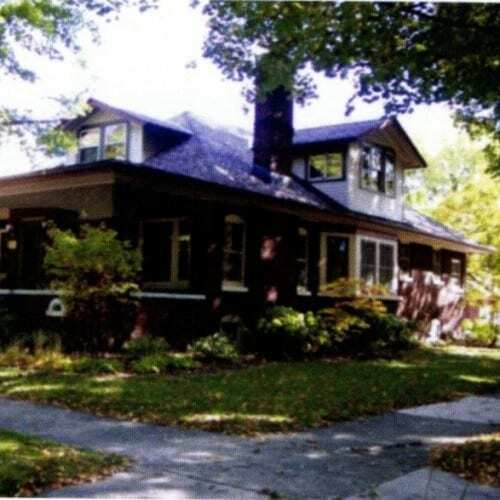 A four square house built of cedar shake, with a rounded front entry and a fan light above the door. An English cottage of brick and frame construction, highlighted by a turreted front entrance. 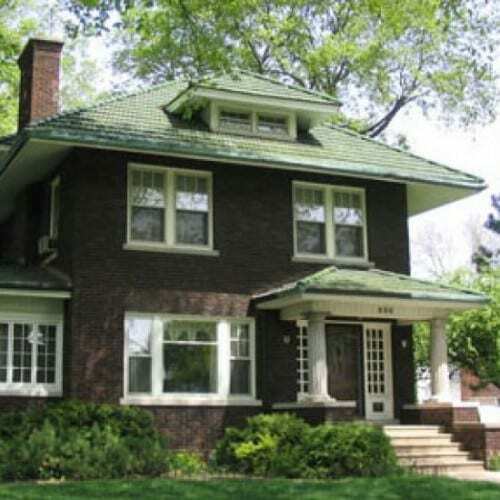 This house was built in 1923 for Milford Hull, constructed from plans that came straight from Great Britain. Hull was the Morris Fire Chief and the owner-operator of the Morris Grain Co. 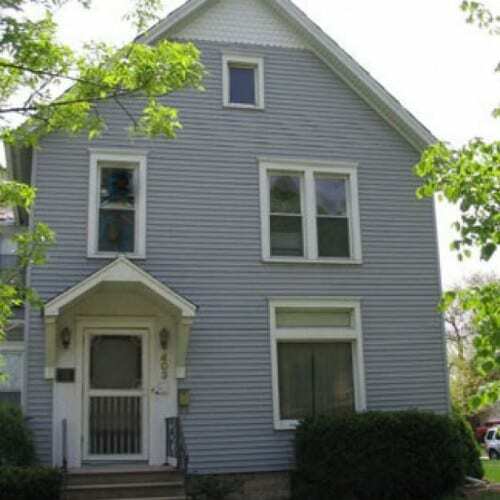 Inside the home, there’s a grand stone fireplace, hardwood floors, and the original bathtub and stand-alone shower. 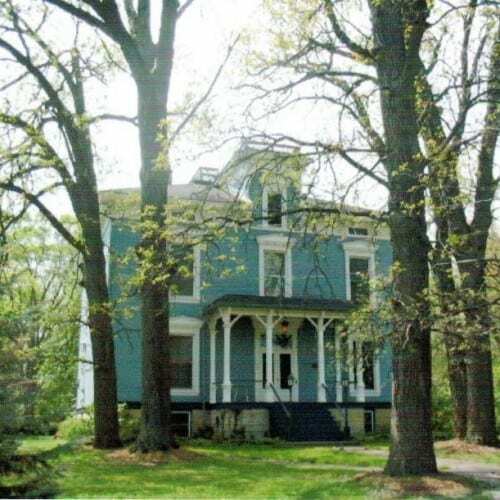 A statuesque three story Italianate mansion with a striking blue color jumps out at passerby through tall trees flanking the property. 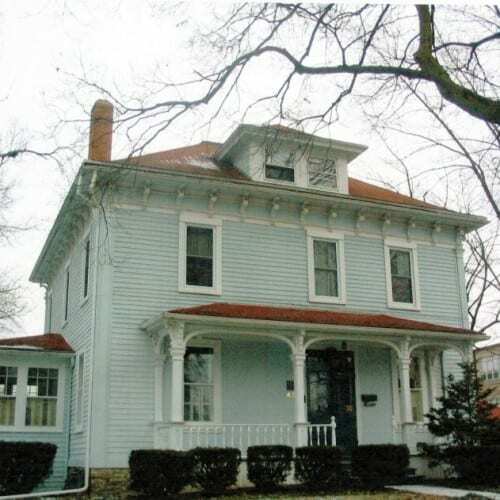 The home was built in 1875 for Edward Stanford, the first principal for the Morris School District and later a successful lawyer. The property went to his son, Frank, in 1909. 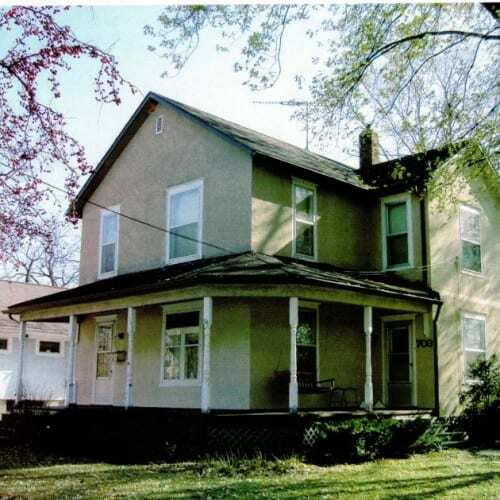 The home changed hands several times and stood unoccupied for a number of years until it was bought in 1979. Today the home retains much of its original splendor, including Tiffany chandeliers, detailed woodwork, and marble fireplaces. 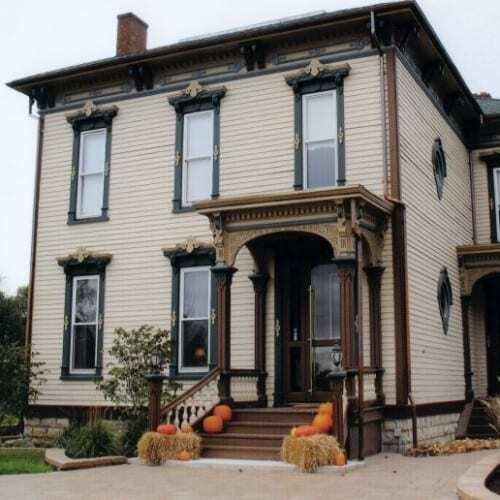 A brick Italianate with round arched windows and sawn work porch decorations. The bricks were made locally. 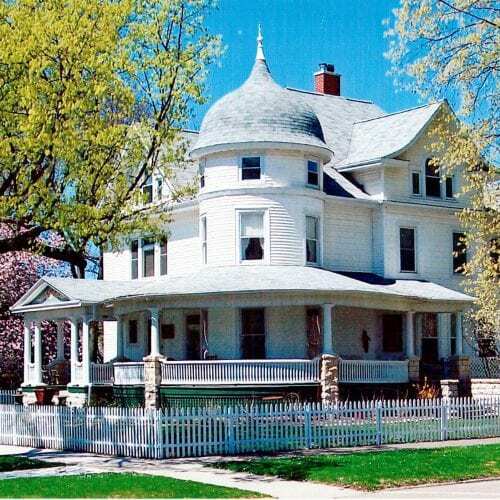 A unique corn belt cube house with peaked hip roof decorated by an open gable, roof brackets, and a cross framed round window. A classic Italianate with tall, paired arched windows and a hooded doorway. This farm house for the Blair Dairy was moved from across the street during construction of Morris Community High School. 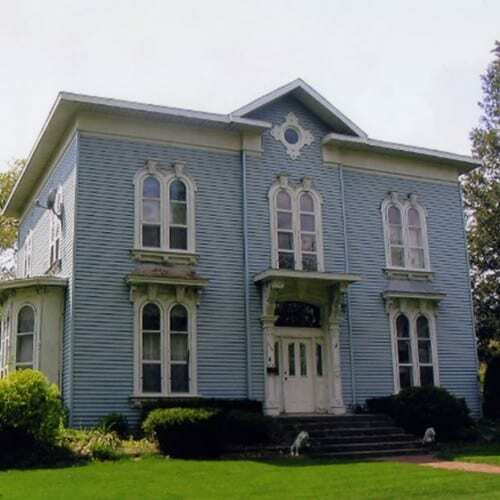 Samuel Hoge built this Italianate mansion for his daughter as a wedding present at the time of her marriage to Civil War Capt. 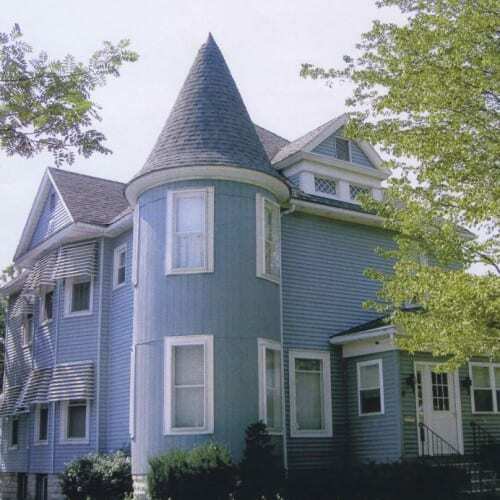 William Reardon, Jr.
An unusual example of Folk Victorian architecture with a hip roof, and an eclectic medley of shingles, porch spindles, window framing , and other decorative elements. A Balloon frame home built for a coal miner who became a clothing merchant. 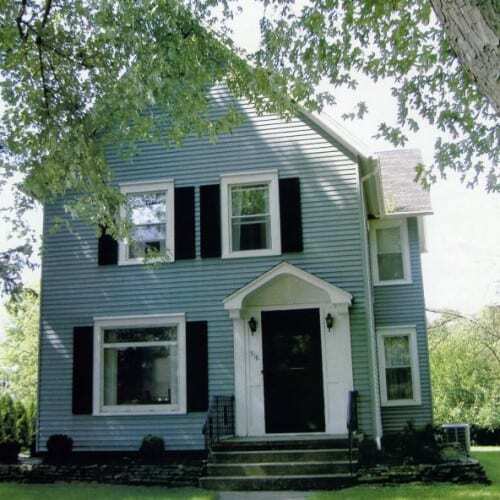 Queen Anne-Colonial Revival style with a wrap around porch and unique exterior trim. 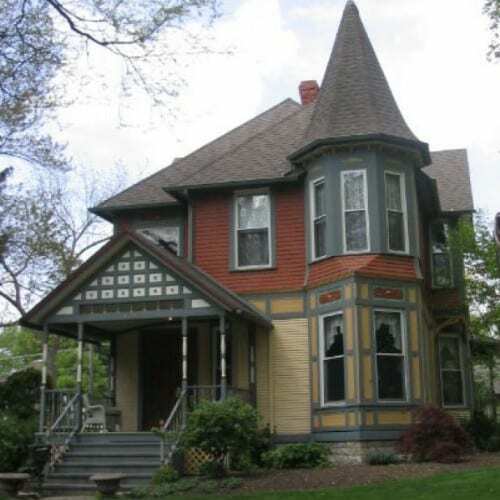 Late Victorian with unusual four gable roof and elaborate interior woodwork. Built by a local grocer and shoe salesman. 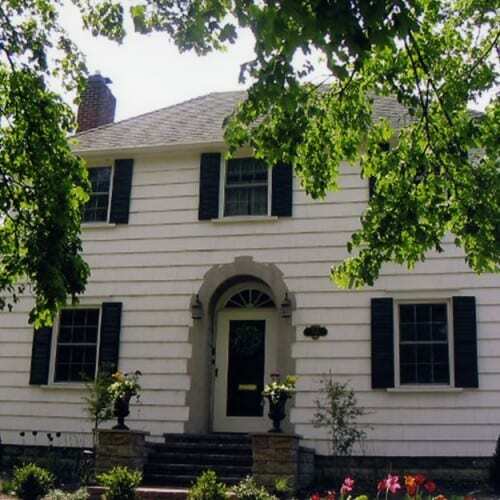 A gable front house with a Greek revival roof line, first owned by entrepreneur investors. An Italianate urban row house surrounded by the original wrought iron fence. Custom built family home occupied by six generations. 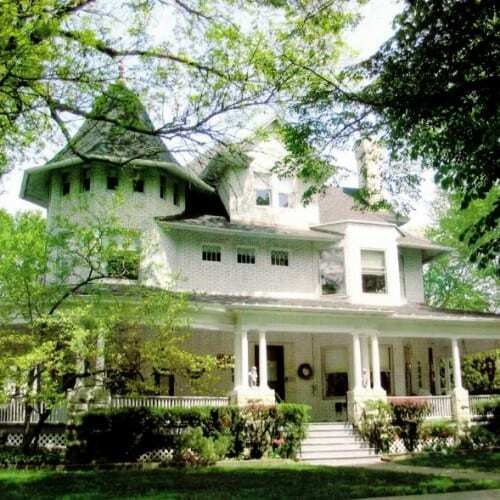 A Queen Anne with three covered porches, two ornate chimneys, sunrise and sunset gables, a turret, and fish scale shingles. The interior rooms are finished in a variety of different woods. Bungalow rebuilt on the original foundation after the first house, built by the Morris Fire Chief, burned. 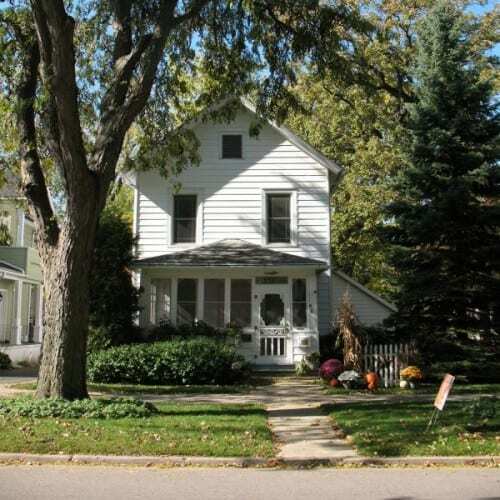 A five room cottage with a cobblestone porch and attic dormer window. 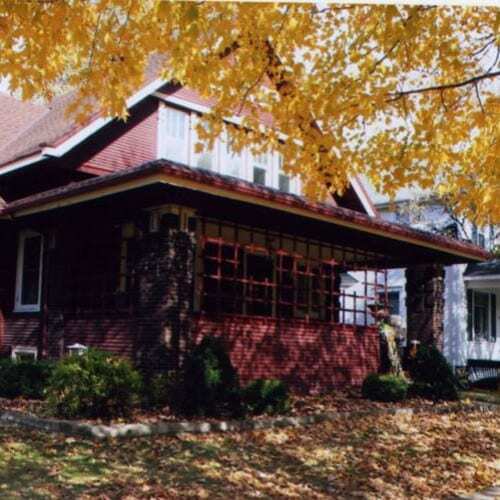 Bungalow with hipped-gable roof, an open stairway flanked by wooden columns, and hardwood floors. An unusual wood framed Queen Anne with a conical turret. 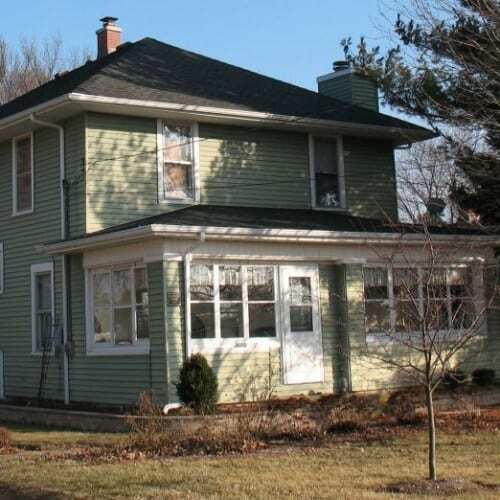 Built on the cross plan with multiple gable roofline before construction of Route 47. 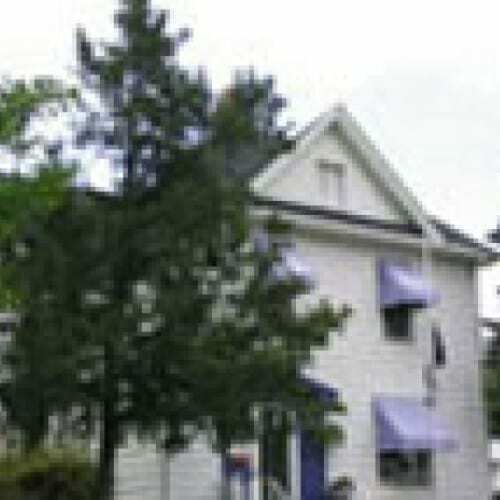 Plain yet dignified Georgian style house was home to a prominent local attorney. Perry Armstrong played a crucial role in having Morris established as the Grundy County seat. He also was a local historian and writer, who was a friend of prominent tribe leader Chief Shabbona and Abraham Lincoln. He entertained both in this home. 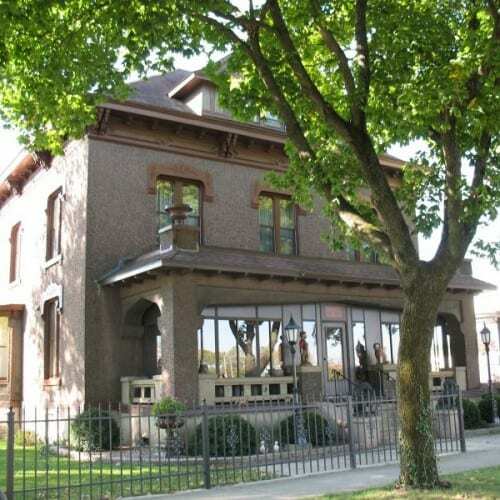 The house was later occupied by Lyman B. Ray, a leader of the local Republican Party, who would go on to become Illinois Lieutenant Governor in 1888. The house is built on the double-pile plan, with a central hall flanked by two rooms on each side. There are no gutters. A “water table” protects the foundation from water running down the walls. 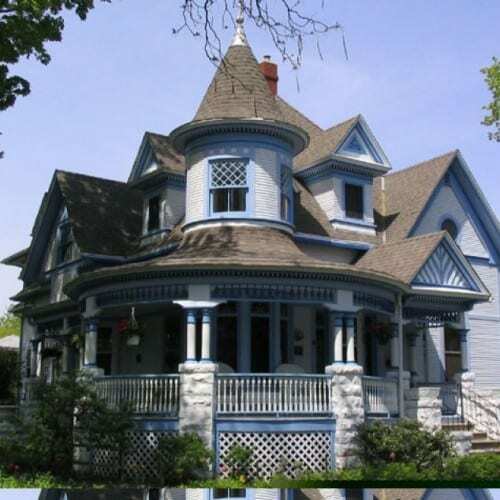 This beautiful Queen Anne Victorian home features a wrap-around porch with a formal entrance, as well as one to the parlor. The entrance still has the orininal frieze. 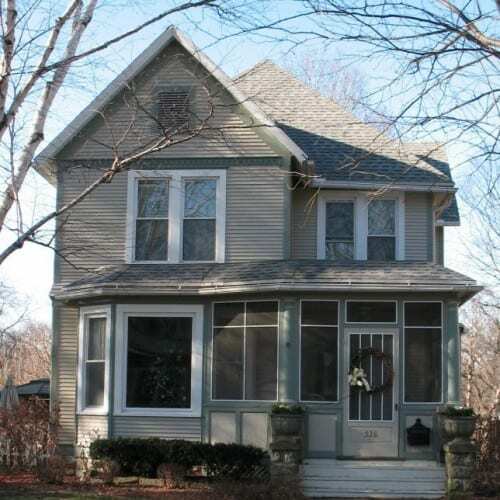 The house also boasts several leaded glass windows. 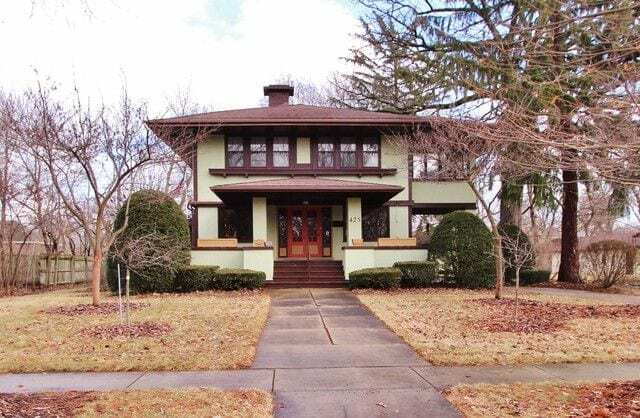 This Prairie Syle home is a Frank Lloyd Wright copy and features extensive woodwork, 16 stained glass door panels and a porte chochere. The bow window in the dining room was the first in Morris. 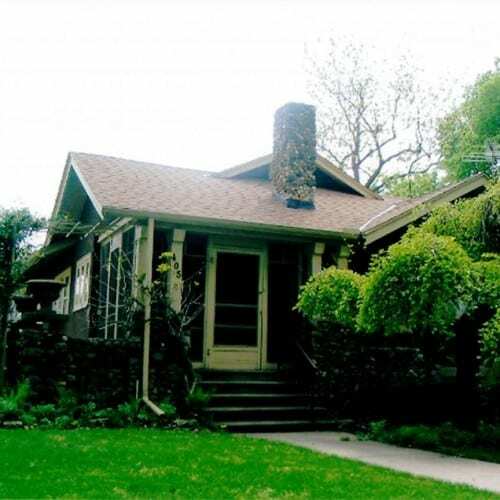 A unique feature of this two-story stucco house in the quarter-sawed oak wood.